Following are eleven signals and systems concepts that apply to the design of a signal processing system known as an audio graphic equalizer. When you listen to music on a portable music player or a computer, you can usually customize the sound— you can re-shape the frequency spectrum of the underlying music signal to suit your tastes using a set of ten tone controls. As the signals and systems engineer, you need a better understanding of the frequency response of the listening halls targeted for the presets list. The shape of the frequency response that the equalizer must represent dictates the core requirements of the equalizer architecture. For example, the frequency response extremes are of special interest, as they will help establish the frequency response shape of the individual filters, the gain extremes needed per filter, and maybe the sampling rate. The acoustics research reveals information about the frequency response shapes that the system must model. For a discrete-time implementation, you must choose the sampling rate to capture the relevant frequency bands of interest for audio signals. The sampling rate is most likely dictated by the audio playback sampling rate. For studio grade equipment, a sampling rate of 48, 96, or 128 kSPS is appropriate. 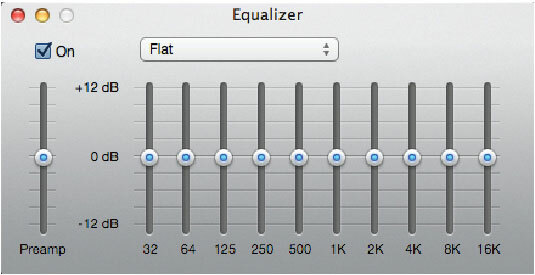 For compact disc (CD) quality sound, the standard is 44.1 kHz. Excess sampling rate drives up the signal processing requirements as the sum total of samples per second and filtering requirements of multiplies and adds per filter come to bear on the implementation needs of the design. You have to look at the basic filter type for the design in content of many filters acting roughly independent of one another. With each slider, you want the ability to raise and lower the volume of just one band of frequencies independent of the other bands, which you may want to hold fixed, with no level changes. You want the filter to be relatively simple because you’ll need many filter bands, but the filter needs to be easily tuned for the different band applications. The ideal filter is one that passes all adjacent frequency bands with unity gain yet can raise and lower the gain over a narrow band of frequencies. The filter of choice is known as the peaking filter. The frequency response plots you get as part of the acoustics research provides information about how many filter bands are needed. Practicality also comes into play here as does tradition. Tradition shows that ten octave band-spaced filters make a reasonably good audio equalizer design. In particular, octave band center frequencies spread from 31.25 Hz to 16,000 Hz, reasonably covering the 20 Hz to 20 kHz audio spectrum. A candidate architecture approach for the ten-band equalizer is to insert a cascade of ten digital peaking filters having system function Hi(z), i = 0, 1, . . . , 9, between the signal source and the digital-to-analog converter (DAC). Ideally, each filter has a frequency response magnitude that provides unity gain (0 dB because 20 log10 = 0) everywhere except in a narrow band of frequencies about the center frequency given under the sliders. The pass bands of the filters are contiguous so that the ten bands together approximately cover the audio spectrum from 20 Hz to 20 kHz. The idealized frequency response magnitude of the cascade is shown for a particular equalizer setting and sampling rate fs. A peaking filter provides gain or loss (attenuation) at a specific center frequency fc. A peaking filter has unity frequency response magnitude, or 0 dB gain, at frequencies far removed from the center frequency. At the center frequency fc, the frequency response magnitude in dB is GdB, which is continuously adjustable over a range of, say, +/–12 dB. Before committing to a final design, you need additional characterization. At the same time, the filter complexity is revealed, because studying the frequency response means you’ll likely need to work from the system function. From the system function, you can also arrive at the difference equation representation, which is closely related to a filter implementation algorithm. The parameter Q is inversely proportional to the filter bandwidth. For a fixed Q, 3.5 ripples occur between the octave bands. The ability to implement peaks and valleys in the overall frequency response traces back to the acoustics research and also to the need to cover ten octaves from 31.25 Hz to 16 kHz. If Q is too large, the ripples in the cascade frequency response mean that some frequencies can’t be gain controlled at all, but if Q is too small, the individual pass bands bleed together, making it more difficult to represent frequency response detail. A Q of 3.5 is chosen for the remainder of this design analysis. The acoustics research and equalizer preset needs dictate the range of gain value needed for each slider. As a practical matter, too wide a range of gain values make the processing algorithms more complex because of dynamic range considerations. A reasonable starting point is +/–12 dB. Note that CD audio is recorded with 16-bits of dynamic range, which corresponds to about 96 dB of total signal dynamic range. Allowing an equalizer to raise and lower the gain of individual frequency bands by +/–12 dB adds an additional 24-dB dynamic range onto the system. You need more bits of precision in the output signal stream to make this viable in the system DAC. When implementing discrete-time systems, you have the choice of using floating-point arithmetic or fixed-point arithmetic for the filter difference equations. Fixed-point math is generally more efficient, depending on the processor architecture. If the processor supports floating-point operations, floating-point is the way to go. But in small battery power devices, floating-point may not be available. You need to study the peaking filters to see whether all ten octaves can be readily built by using fixed-point math without incurring any performance penalties. When using fixed-point math, the bit width is generally 16-bit signed numbers, while floating-point is generally 32 bits. You need to conduct a so-called bit true arithmetic test bed to fully exercise the equalizer with real test signals from standard music sources. The idea with the test bed is to be able to evaluate the complete system performance with real signals and real equalizer presets that the customer has asked for. With the test bed, you should be able to exercise all critical requirements of the design. The real deal with the ten-band equalizer is that you can graphically visualize the spectral shaping you provide to the signal passing through the equalizer by just looking at the positions of slider gain controls.